When using stains or dyes, there are few limitations in color or design possibilities. Decorative Concrete Institute in Temple, GA.
Ready to take advantage of a color explosion? Here's an overview of the various types of concrete stains and dyes on the market, followed by important questions to ask before choosing a product for your next project. Keep in mind that once you apply stains and dyes, the color is permanent. So whatever product you choose, be sure to test it in an inconspicuous area on the surface to be treated to ensure the color and aesthetics are exactly what you're aiming for. Some manufacturers sell small sample sizes of their products or test kits with samples of every color in their line. What color effects do you want to achieve?Much like how painters achieve different effects with water colors versus acrylics, concrete contractors can achieve different results based on rather they use acid stains, water-based stains or dyes. Learn more about how the product you use will impact the color effects you can create. What is the condition of the concrete?Factors such as whether the concrete is new or old, is contaminated with dirt or grease, or has patched areas should be considered when deciding on the best coloring product. Find out more about the condition of the concrete influences coloring. Can the Product Be Used for Both Interior and Exterior Applications?Because they penetrate the concrete surface, most acid- and water-based stains have excellent UV stability and wear resistance, permitting you to use them on both interior and exterior concrete slabs. However, makers of some dyes do not recommend their products for exterior use because the color can fade when exposed to direct sunlight. If you are considering using a dye for an outdoor project, be sure to check its suitability for exterior applications. Most manufacturers also recommend applying a clear sealer to newly stained or dyed concrete for additional protection from abrasion, chemicals, and UV exposure. How Easy Is the Product to Mix and Apply?Most stains and dyes are very user-friendly. 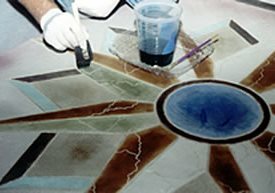 Some products come ready for use (as is the case with most acid stains), others simply require combining two components, such as a pigment and base resin (as with many water-based stains). Dyes often come as a liquid concentrate or powder that you dilute with an appropriate solvent or water before application. Stains also may require dilution with water or muriatic acid if you want to lighten the tone instead of using the stain full strength. Whatever product you decide to use, the key is to thoroughly shake or stir it right before application to ensure even pigment distribution. Are Special Application Tools Required?The coloring method you select as well as the project design will determine what application tools you’ll need. You’ll also have to take into consideration the size of the job. Get help deciding what application tools are best for you. What Is the Average Coverage Rate? "Average" is the operative word when assessing the coverage rate of a stain or dye. Manufacturers will typically give you an average range (in number of square feet per gallon), but state that the rate can vary dramatically depending on such factors as the porosity of the concrete substrate, the color intensity you wish to achieve, and whether you plan to apply the product full strength or diluted. Still, this figure can be helpful when comparing the prices of different products and when estimating how much to buy. Keep in mind that you may need to apply more than one coat of stain or dye, depending on the effects you want to achieve and whether you want to layer various colors. Consult with the supplier for further assistance in estimating coverage rates for a particular project. Are Safety Precautions Required During Application?Before purchasing or applying a stain or dye, always read the safety precautions provided by the manufacturer (often you can find these on the manufacturer's website). Chemical stains and solvent-based dyes will require greater cautionary measures than water-based products. That's because most chemical stains contain corrosive components (including hydrochloric acid and chlorides) that can cause severe eye, skin, and lung irritation. And solvent-based dyes can be highly flammable and produce vapors that are hazardous to breathe. When using these products, workers should wear impervious gloves and boots, splash-proof goggles, and facemasks or respirators to prevent inhalation of fumes. Products containing solvents must be kept away from combustible materials and heat sources and applied in rooms that are well-ventilated. For projects in occupied spaces or where ventilation is poor, water-based stains and dyes will be your best choice. These products typically have a low VOC content and are safe to apply indoors without concern for odors or toxic fumes. How Long Is the Drying Time?This could be a critical issue on fast-track projects where you need to open the surface to traffic as soon as possible. Chemical stains require the longest drying times between coats (typically at least 5 hours) to give the stain time to react. Then the stain residue must be rinsed off and the surface permitted to dry before a sealer can be applied. Water-based stains offer the advantage of shorter drying times (about 2 hours) with no rinsing required. Dyes generally dry very quickly, reducing the amount of time it takes to complete a job by as much as 60%, according to Davis. "Some solvent-based dyes dry in less than a minute. Plus, cleaning is minimal and does not require water," he says. How Much Cleanup Is Required?One of the chief disadvantages of using chemical stains is the requisite cleanup work. 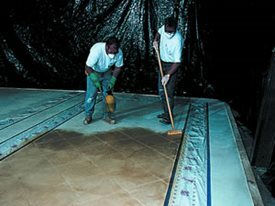 After stain application, you must scrub the slab thoroughly to remove any stain residue and to neutralize the surface. Manufacturers recommend using a neutralizing solution of water combined with ammonia or baking soda followed by rinsing with clean water. You can also use an alkaline soap. Residue can be scrubbed off with a broom, mop, or floor scrubber and then picked up by a squeegee or acid-resistant wet vacuum. You must also take safety precautions when disposing of the residue and rinse water. Water-based stains don't require neutralization or rinsing, and application tools can usually be cleaned with mild soap and water. In most cases, there is no reason to clean the concrete slab after dye application because dye particles are very fine and absorbed into the surface. However, if too much dye is applied, you may need to remove the excess with a mop or wet vac. What is a True Concrete Stain? Dyes vs. Stains: What are the differences?